British (English) actress. The leading Shakespearian actress of her generation. ALS (signed with initials). 2pp. 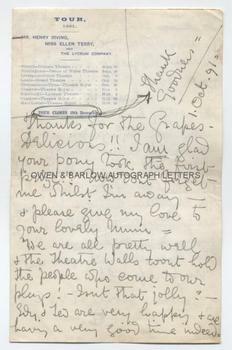 On letter headed paper of her 1891 tour with Henry Irving and the Lyceum Company. 1st October 1891. No addressee is named. Together with a real photograph post-card portrait photograph of Ellen Terry. "Thanks for the grapes. Delicious!! I am glad that your pony took the first prize!! Now don't forget me whilst I am away - & please give my love to your lovely Mum. We are all pretty well & the theatre walls won't hold the people who come to our plays! Isn't that jolly? Edy and Ted are very happy & are having a very good time indeed. I'll send you a photograph of Alexander Oldworthy and Nance Oldfield - to add to your collection, if you will care to have it. Something has gone wrong with my stylograph - & I've dozens of letters to write. I do wish Edy and Teddy had the gift for letter writing that you children have. My fingers ache sometimes. It seems so funny to be feeling well!! I'm strangely well just now - [next two words undeciphered] . . .!!! Love - Love - Love." 8vo. Approx 8 x 5 inches. Remains of a small mounting hinge on upper left side edge. Very good. The photograph measures approx 5.5 x 3.5 inches and has slight silvering to edges of image and mounting residue to verso. 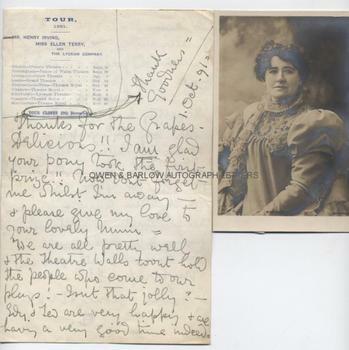 An exuberant letter - perhaps because her long tour with Henry Irving was nearing a conclusion (she has circled the printed words Tour Closes 12th December and has written the words "Thank Goodness". 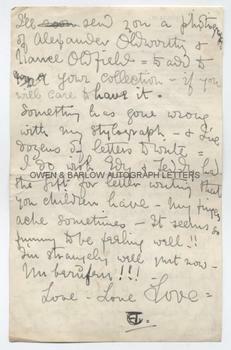 The letter is evidently to the children of someone who is well known to her - possibly a family member or a close friend. Alexander Oldworthy and Nance Oldfield are characters in Charles Reade's one-act play, 'Nance Oldfield', the rights to which Ellen Terry had purchased. There was no part for Henry Irving in this and in the first performance the part of Alexander Oldworthy was played by her son, Edward Gordon Craig. 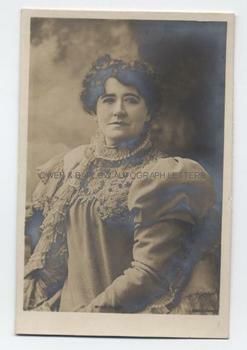 Ellen Terry appears to have taken both her children on the tour with her - Edith Craig and Edward Gordon Craig (the Edy and Teddy referred to in the letter) and both were, at this time, still part of the Lyceum Company. Ellen Terry had separated from their father, Edwin Godwin in 1875 (she had previously been married to the painter Frederick Watts). She had married Charles Kelly in 1877 but had separated from him in 1881 and during her time with the Lyceum Company she is thought to have been romantically involved with Henry Irving.